Home → Damien Zone → Giorgio Tsoukalos is an ancient astronaut. You should see him shirtless. Giorgio Tsoukalos’ Mysterious Hair Created By Ancient Astronauts. UPI VIENNA: Doctors at the Austrian Insititute for Ancient Alien Visitation in Vienna have taken hair samples from ancient astronaut expert Giorgio Tsoukalos’ head and determined that Tsoukalos is definitely part human and part alien or part something unknown. DNA samples suggest a relation to another man who was seen only once on a ski slope in Aspen — a man-creature of some sort who quickly vanished over a mountain top when he realized that he was being watched by UFO investigators. While authorities were unable to track the strange man, tourists in the area gave local police a highly accurate description of the man and a composite sketch proved to be very accurate. A local skier In Aspen, Colorado, USA who just happened to be familiar with the mysterious case at Khufu was standing in line at the ski lift when he spotted the man and instantly made the connection between the composite sketch and the reports from Egypt over ten years ago. The man who spotted the mystery hair man cannot be identified because he now has a high level of clearance within the US Government’s Intelligence. He did, however, immediately call authorities while keeping his eyes on the man. When the authorities arrived, the mystery hair man grew suspicious and darted through the line and grabbed a seat to the top of the highest slope. A helicopter search of the mountain top found nothing — not even footprints in the snow. The wired-haired man had simply vanished through one of those time portholes that Georgio Tsoukalos seems to suspiciously know all about. “The sketch was so accurate that the there is no question that the mystery man with the wire-crazy hair in Aspen is the man who emerged from the pyramid,” said Traherne. Giorgio Tsoukalos has risen to TV fame with his wild and totally outrageous appearances as a self-proclaimed expert on Ancient Alien Visitation — or the theory that God was an astronaut — or the idea that alien beings came to earth a long time ago and today are represented in ancient writings as winged serpents and flying dragons and many other various alien forms. The show is called “The Ancient Aliens” and it’s quite popular with kids and people who believe that crystals will take you to other galaxies — you know, people from San Francisco. But is Giorgio Tsoukalos really a crazed, self-proclaimed, ancient astronaut expert with wild hair that make you want to jump out of your chair and buy the guy a comb, or is he perhaps an ancient astronaut himself? 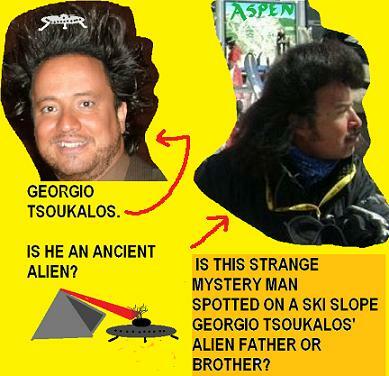 Something is certainly suspicious because Giorgio Tsoukalos refuses to talk about or even acknowledge the mystery man in Aspen or the fact that his own DNA sample has been sent to NASA and the CDC pending further investigation. He simply refuses to talk about anything except ancient aliens and ancient astronauts — and his barely audible foreign accent is so irritating that the producers of the show are thinking about dubbing his voice with that of an actor. Dr. Traherne is infuriated by Tsoukalos’ fame and fears that the American taste for TV will undermine the truth — a truth he fears might be dangerous. “Giorgio Tsoukalos is a goddam alien I tell you, and he is going to destroy the human race,” asserted Traherne angrily as he pounded his fist on his desk and had to be restrained by The History Channel’s crack team of security gurads. Traherne vows to track down the mystery man who was last seen in Aspen and he further vows to prove that Giorgio Tsoukalos and that man are father and son or perhaps brothers. He vows to bring them down and prove that they are manipulating human knowledge and public conciousness. He hopes to get the truth from them about their origins and perhaps help Traherne unlock the secrets of the Universe! “Before they tell me anything about the universe and ancient astronauts, I am going to force Georgio to fix his hair,” said Dr. Traherne.